I love the taste of maple. Pair it with bacon and cornbread and you’ve got an amazing combination. I made these in a square brownie pan just for fun and to change things up a little. Nobody said everything has to be baked in muffin tins or one big round bread. 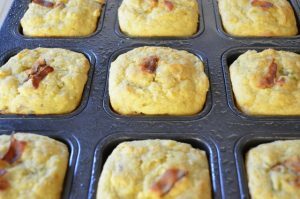 I topped the cornbread with crumbled bacon before baking. You can just see it peeking out. Enjoy these with soup, crumbled in chili, or make an awesome cornbread stuffing. Anyway you serve these, you’ll be coming back to this recipe again and again. Whisk together the gf flour and cornmeal in a large mixing bowl. Add the buttermilk ( or cream if you’re using that) to the flour mixture and stir together well. Cover the bowl with plastic wrap and let sit for 2 -3 hours on the counter, or in the frig overnight. 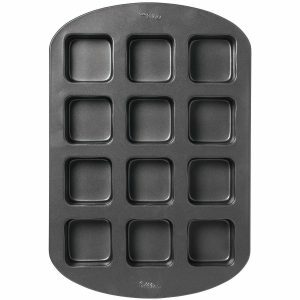 Grease a square brownie pan or 12 muffin cups with shortening. 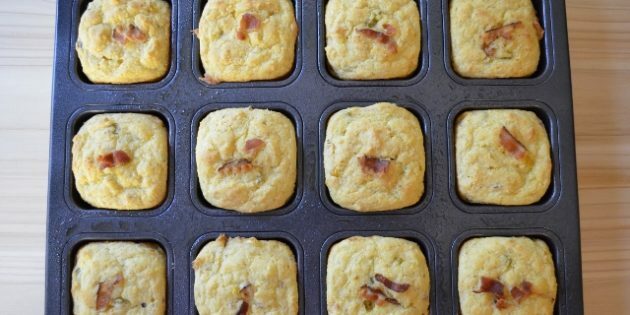 If you don’t want to grease a muffin pan, you can just line it with paper liners and save the fuss. Toss in the butter, honey, egg, baking powder, baking soda, salt, and 4 strips of the crumbled bacon to the cornmeal batter. Use a hand held electric mixer and beat on high for about 2 minutes. Use a cookie scoop and plop the batter into the prepared pan. Sprinkle the rest of the cooked bacon on the top of each one. 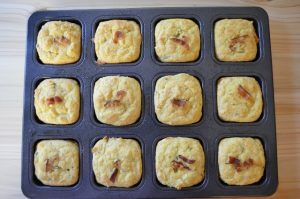 Bake cornbread squares for 18 to 20 minutes or until a tooth pick inserted in the center comes out clean. Bake the muffins for 22 to 24 minutes and test with a toothpick to make sure they are baked through. Remove from the oven and place on a wire rack. Let them cool for 5 minutes, then take them out of the pan and place on a wire rack to cool completely. Here’s that cute brownie pan I used for my cornbread gems. 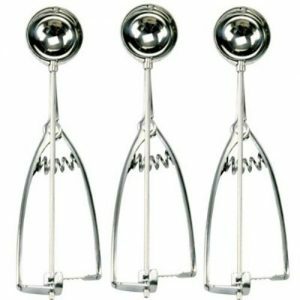 Here’s that set of cookie scoops that I like. They really do make life a lot easier. Not to mention less sticky and messy . If you click on the links on this post, I will receive a small commission if you purchase something. Thanks for all your support in my baking endeavors. It is greatly appreciated.